We can Open 24 hours- Available 24 hours upon reservation. Very little echo and reverberation. Environment works well especially for wind instruments along with jazz and fusion bands, as the room is not completely anechoic. Vocals may be heard clearly without feeling like being in a small studio. Each instrument may be heard clearly and separately, convenient for arrangements. Includes whiteboard with markers and electric fans. Rehearsal Hall is available for 24 hour use as it is perfectly sound proof from the outside. Air conditioned and ventilated with adjustable dimmer lights and good ambience. Large mirrors are attached to the wall (largest 8.5 m x 4.2 m) to allow the same arrangement on stage and in the studio. Please help keep the room and all appliances clean at all times. Please be considerate of other bands and players. Please do not wear shoes, eat, drink, or smoke inside the studio. Chubu Area’s No.1 Independently owned and operated professional recording studio. Consists of one Main Booth, Sub-booth, Vocal Booth, and Control Room. 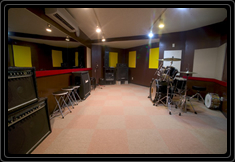 Aside from the Main Booth, two other booths are available for recording, so that a 3-4 part band may record simultaneously. No need to use a patch bay, just plug directly into the headphone amp. Main booth is (Room Height 2.8 m), lined with brick walls and solid wood floors. The Vocal Booth (Room Height 2.4 m) is also somewhat anechoic, may also be used for bass amps. Electric line and trunk/main line are connected to breakers, thus there is no need to fuss over electric outlets. 100V and 117V are also available, so there is no need to worry about transformers as both are available. Furthermore, the studio has been designed with air-conditioning and light adjustment to provide a comfortable, relaxing, and natural recording experience. Please do not wear shoes inside the recording studio. 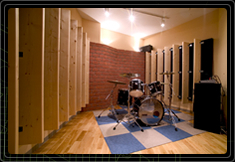 The recording studio may also be used as a rehearsal room, although with certain limitations. For more information, please inquire here..
Free pamphlets are available, please inquire via e-mail. Technical support for restaurant and karaoke parties is available. Please note all rentals will include engineer services. Please consult with engineer if only renting equipment. For equipment and past events, please refer to HERE. Please bring one piece of ID when registering for membership. Please note all prices above reflect membership prices when all members of a band/group are members. 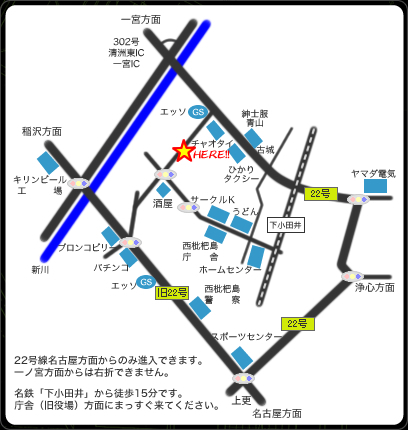 Non-member/visitor fee: + JPY 500/ per hour. In the case all band members do not have membership, studio use will not be allowed. Please bring your membership card to the studio each time. In the case one does not have their membership, regardless of the reason, the non-member/visitor fee will be charged. Lessons are taught by professional teachers and are available for beginners and those looking to become professional. However, please note beginners should avoid distracting behavior during lessons to ensure smooth lessons. Those aiming to become professionals may finally level up! Demo recording, audition tapes, etc, may also be done and sent from the studio. Teachers for different instruments in different areas are available. For more information, please inquire here. 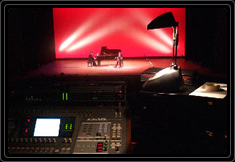 News 90 Professional Music Studio proudly boasts professional and amateur musicians that have recorded at the studio. We are confident in the studio’s calming environment and sound quality. As the owner has worked in the music business his whole life, he has ventured to Tokyo and come back to Nagoya to create a music studio based upon his professional experiences in the music business.